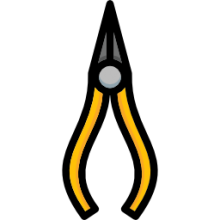 Needle-nose pliers (they are called long-nose pliers, pointy-nose pliers, snipe-nose pliers, pinch-nose pliers) are both holding & cutting pliers frequently employed by electricians, arts & crafts types, jewelers, tradesmen, and home owners for common residential repairs (Wikipedia). They are often used to work with wires- bending, positioning and snipping them. Their long-nosed design provides a high degree of handling control while their cutting edge, located near the joint, gives them a dual functionality. They're great for accessing small, tight areas, and working on intricate, delicate materials that you can't grip with your fingers (Wikipedia). These 8", nickel-chromium steel long-nosed pliers are a popular option. An induction hardened build keeps their edges sharp and construction durable. They feature ridged jaws with wire-cutters close to the joint. While they are made in China, reviewers indicate that they aren't shoddily made. If you want a U.S. pair of long-nosed pliers, check out the Channellock pliers. Reviewers commend how comfortable they are to use, with professional electricians and DIY types endorsing their functionality. These nose pliers offered by Stanley are inexpensive, well-made and useful for tight spaces. Users love that the pliers are comfortable to use, but some do note that the tips bend. These needle nose pliers measure 7.6” x 0.5” x 2.9”, and they have long tempered jaws, which allow you to work in difficult to reach places. They feature a chrome-nickel steel construction, a rust-resistant finish, double-dipped handles, and slip-resistant jaws. The pliers also have hardened cutting edges, a length of 5 inches, a weight of 3.2 ounces, and a lifetime limited warranty. In general, buyers agree that the Stanley needle nose pliers are one of the best nose pliers available, and they praise their sturdiness and design. A happy user comments that he has owned these long nose pliers for six months and that they don’t show any signs of wearing. The reviewer also says that they are easy to use with one hand and that they have a comfortable grip. However, he notes that they are small and after an hour his hands start to feel stiff. Another purchaser mentions that if you need to do work in hard to reach spots, this is the perfect tool for the job. He also states that they are ideal for delicate parts because the nose pliers grip tightly. However, some customers have complained that there is a gap between the two jaws and that the pliers don’t stay close. Some users also note that the pair of pliers they received was 6-inch long. If you’re searching for top-notch needle nose pliers, you might consider these long nose pliers offered by Irwin. Users love the soft grips and the solid construction, but some do note that the handles are slippery. These 5-inch long pliers measure 10.2 x 3 x 0.5 inches, and they have a durable nickel chromium steel construction and a weight of 11.4 ounces. The pliers also feature ProTouch grips that provide comfort and prevent fatigue, and induction hardened cutting edges, which will stay sharp for a long time. The machine jaws ensure maximum gripping strength and the pliers meet ANSI specifications. A buyer comments that these long nose pliers are a pleasure to use and that they are lighter than similar products. The reviewer adds that they are very comfortable to use and that he would gladly buy another pair. A happy purchaser says that these 8-inch pliers feel solid and that he recommends them to any electrician. The reviewer also says that the quality far surpasses the price and that the handles are comfortable to hold. Another satisfied buyer mentions that the pliers have an excellent grip and that they are ideal for bending or cutting guitar strings. However, some customers have complained that there is a gap present and that the jaws don’t close at 100 %. A user also notes that these pliers are made in China, and the quality is disappointing. 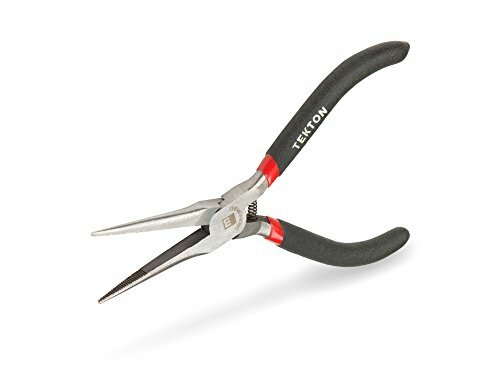 These precise needle nose pliers offered by Tekton are light, handy and useful for repairing jewels, electronics, and clocks. Users love the precision of the pliers, but some do note that they are made in China. These long needle pliers measure 9.8” x 2.5” x 0.8”, and they have an ultra-thin nose with fine tips, which makes them useful for gripping small parts and bending wires. They feature a self-opening, spring-loaded action, slim non-slip grips for better control, and a weight of 1.6 ounces. The Tekton pliers are made of forged and hardened carbon steel, and they are suitable for hard to reach areas. In general, users have a favorable opinion of the Tekton needle nose pliers, and they praise their precision, size, and performance. A buyer comments that the needle pliers grip tightly, they don’t slip or bend and that they are perfect for confined spaces. The user adds that you can use them all day and you won’t tire much. Another happy customer states that he uses these precise nose pliers for chainmail jewelry and that they don’t scratch or damage the wires, even though they have teeth. The reviewer also mentions that the jaws close together cleanly and that these are one of the best jewelry pliers he has ever owned. However, some customers have complained that the pliers broke quickly and that the jaws don’t close all the way. Some users also note that they got rusty after a couple of months. These jewelry nose pliers offered by Sona are well-made, comfortable and practical for delicate work. Users love the price, but some do note that they have a problem with the spring. These long needle pliers measure 6.1” x 5” x 2.5”, and they feature cushioned grips for added comfort and a weight of 2.4 pounds. They also have box joint and double leaf springs. However, be aware that the manufacturer warns that the product you receive might vary in color and design due to innovations. Overall, this is an excellent choice if you need a cheap pair of pliers. A customer shares that these needle pliers are among the best long nose pliers that he has encountered and that the padded grips are extremely comfortable. Another user shares that he was extremely surprised by the quality of these the Sona long nose pliers and that the spring provides adequate tension so that the jaws open easily. The reviewer adds that they are perfect for plastic models and that she highly recommends them. A satisfied purchaser shares that the needle pliers are ideal for small items, especially jewelry and that they are long enough to reach comfortably into tight spaces. However, some customers have complained that the quality is not what they anticipated and that the tips don’t meet as they should. Some users also state that the tips are too blunt and too thick. If you are looking for inexpensive long needle pliers, you might take a look at these nose ring pliers offered by Uxcell. Users love that the pliers are perfect for tight areas, but some do note that they aren’t suitable for heavy-duty jobs. These long needle pliers measure 5″ x 2″ x 3/8″, and they have plastic coated handles that provide comfortable and secure grip. The pliers also feature a double leaf spring for smooth motion, a polished head to avoid marring, and a weight of 5.6 ounces. As a whole, these long needle nose pliers are excellent for jewelers, beaders or crafters. A purchaser mentions that the Uxcell long-reach nose pliers are a great addition to his gunsmithing tool box and that they look better than the provided picture. 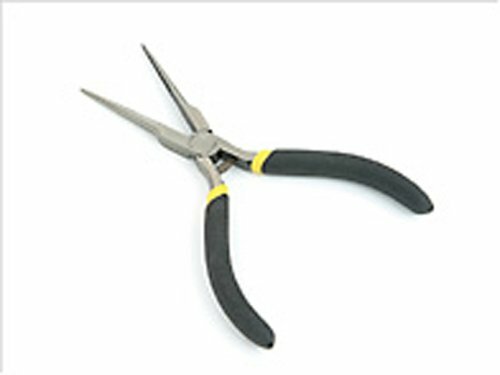 Another customer shares that he uses these long needle pliers for electronics and that they perform smoothly. The reviewer also adds that the pliers arrived quickly and that he recommends them to anyone looking for cheap needle nose pliers. A happy buyer says that the pliers close together well and that he uses them to open 6mm jump rings. However, some customers have complained that the nose pliers rust quickly and that they have a noticeable gap. Some users also note that the grip is not strong and that the quality is questionable. What Are Plier Buyers Saying? The first pair of needle-nosed pinch pliers we took a look at was the Stanley pair. Stanley says that they have designed their stainless-steel pliers with long-tempered jaws designed to reach into normally difficult and inaccessible areas. They are constructed from a chrome-nickel steel and also have a rust-proofing finish designed to have them withstand extended use and inclement circumstances. 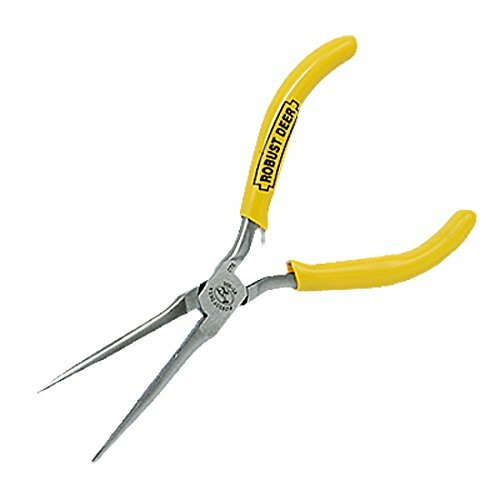 Buyers say that in terms of its uses, they use these needle nose Stanley pliers for fiddling with small and intricate objects, jewelry making, working in tight areas bending wires, and a variety of other home repair purposes. Reviewers we spoke with oftentimes prioritized USA-made long-reach clamping pliers, and this pair received mixed feedback- with one buyer telling us that the metal is poor quality, causing the pliers to bend or in indent if you're working with anything other than really small and fine items. Other buyers say that they had some trouble with the spring mechanism, saying that over time the spring can become misaligned and often doesn't return fully to the open position. Another reviewer we spoke with concurred, adding that in his opinion, as a professional electrician, these pinch plier tools are not machined well- because the jaws are not the same size and do not grind well. The second pair of long nose clamping pliers we took a look at was the Irwin Tools option. These nickel-chromium pliers are induction-hardened to ensure that the sharp, stainless-steel wire-cutting edges maintain their fine blades. One buyer, on the quest for the best pair of pinch pliers, told us that he endorses these long long-reach pliers because they are lighter weight than other options, though a little bit more expensive than them, as well. Another purchaser told us that the handles are particularly comfortable and it has made it their work as a carpenter much easier- its design enables you to dive deep into difficult and tight areas to get the job done. An electrician told us that they were effective for holding and twisting loops in wires in order to hook them onto receptacle terminals- they also were a cinch for cutting wires. Other purchasers told us that while the handles are particularly soft and easy on the hands, they haven't disintegrated on account of the ergonomic padding that Irwin says is designed to reduce hand fatigue. Some electricians said that they purchased holsters for their mini needle plier tools- making them dumb-simple to access while on the job. The third option we examined was the tech Tekton Percision needle nose pliers. These five-inch long electronics pliers have a particularly thin nose and their tips are engineered to access really tight areas, grab a hold of small and intricate parts, and effectively bend wire or delicate computer parts. They are built from hardened carbon steel and their spring action is designed for one-handed use. Some buyers we spoke with run an arts and crafts shop and they keep several of these needle-nose pliers lying around because the tips are small enough to work with some of their more intricate craft projects. Jewelers also have endorsed these precision pliers, telling us that they are ideal for intricate work, particularly with copper wire. The fourth long-reach plier option we examined was the Sona needle-nosed jeweler pliers. These 5 1/2 inch pliers feature cushioned grips with double leaf springs and a box joint for smooth opening and closing action. One reviewer we spoke with, who initially wondered what needle nose pliers are for, thought that the tips were not sharp enough- that they were too rounded to be utilized on particularly fine and intricate items, as a jeweler might use them for. However, some reviewers did endorse these pliers, saying that they are an effective substitute for tweezers, and that while the jaw surface is not highly textured, it is a little bit rough for gripping material. The handles are cushioned with a foam-plastic coating that provides decent tactile response for the user, while the spring loading mechanism helps to pop them back when you relent on the hand pressure. Another electrician we spoke to told us that the rubber coating on the handles makes them easy to grip from the bottom and they are effective for intricate work like picking up minuscule screws to winding especially thin wire around circuit cards, as well as dealing with minuscule connectors. The last option we looked at was the mini long reach needle nose pliers by Uxcell. They feature ergonomic handles coated with plastic, a double leaf spring that provides a smooth and effective grip-and-release motion, and their heads are polished to prevent scarring of delicate items. While some users commended these pliers for their inexpensive price, others said that they are cheap Chinese knock offs that are not manufactured well. Specifically, some of the reviewers told us that the jaws don't clench together evenly, the grip is not very strong and they have found that overtime the steel has a tendency to rust. The majority of users echoed these complaints, saying that in a very short matter of time these microneedle nose pliers quickly succumbed to extensive rusting that made them useless and inoperable. In terms of purchase options, we advocate searching online, though many buyers sought these pliers in stores like Target, Michaels, Lowes, Home Depot & Harbour Freight.